FKS mobile candle filters | Destila s.r.o. Mobile candle filters serve to filter beer, wine and other beverages. 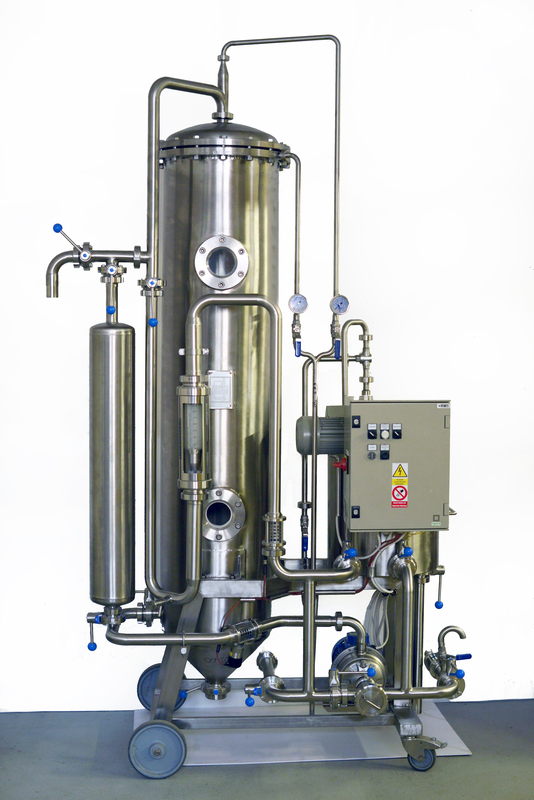 In a single cycle, you obtain 30 – 60 hl of filtered beer per 1 m2 of basic filtration surface. Mobile candle filters have a basic filtration surface of 1 – 5 m2. Larger filtration lines are not mobile. if you keep to the recommended input parameters we guarantee an average of 5 yeast cells per 100 Ml of filtered beer. When filtering wine, the output of the FKS filters increases almost twice the values given for the beer. For filtration of fruit juices and other liquids, we determine the filtration performance parameters based on an individual assessment. we will take care of the warranty service. Total consumption of kieselguhr (for basic filtration and continuous dosing) is 80 to 160 g / hl of beer, depending on its filterability (amount of yeast, protein and colloidal substances in the unfiltered beer). The capacity of a single cycle is 30-60 hl of filtered beer per 1m2 of basic filtration surface. The clarity of the filtrate based on to colloidal substances in the beer and the type of kieselguhr used is between 0.25 and 0.60 j.EBC. FKS mobile candle filters can be washed with countercurrent water or high-pressure sanitizer. This reliably removes kieselguhr residues and impurities, including kieselguhr residues wedged inside the crevasses of the candle, which is not possible with filter screens.